The title of Emilie-Claire Barlow’s new album is “The Beat Goes On,” a phrase that might also describe her career at this point. Sunday night’s show at the Capilano University Performing Arts Theatre was a low-key, though musically satisfying evening featuring the jazz singer leading a talented quartet consisting of Kelly Jefferson on tenor saxophone, Ross MacIntyre on bass, Reg Schwager on guitar and Davide di Lorenzo banging away on the drums. It’s been two years almost to the week since Ms Barlow’s last concert in Vancouver at the same venue. Since then things have been going well for this daughter of singer and arranger Judy Tate and jazz drummer Brian Barlow. Her latest recording is selling well, both in music stores and on iTunesTM as well as earning her a Juno nomination for Vocal Jazz Album of the year. Wearing in a small black dress, Barlow kicked off the 100-minute split set with an audacious interpretation of Raindrops Keep falling on my Head. She followed up with another couple of tunes from The Beat Goes On: Donovan’s Sunshine Superman and a curious bossa nova styled rendition of Bob Dylan’s Don’t Think Twice, it’s all Right. 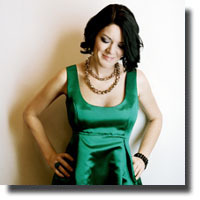 This new repertoire of sixties pop songs, stripped down and reconstructed in an eclectic mix of jazz, pop fusion and bossa nova, is quite a departure for this vocalist who typically favours the “American Songbook.” Barlow was uncharacteristically whimsical on a lush (Astrid) Gilberto treatment of Neil Sedaka’s Breaking Up is Hard to do and downright Rockabilly on He Thinks I Still Care. After ending the set with just about the liveliest version of These Boots Were Made for Walkin’ I’ve ever heard (and I’ve heard quite a few), the Toronto singer and the quartet returned to the stage to perform jazz chestnuts like Almost Like Being in Love. A Latin inflected Pennies from Heaven, a tune which the singer confessed to rarely performing in concert, was given a fun up-tempo treatment before the band invited the audience to take a ride on The Surrey with the Fringe on Top that featured some bluesy solo saxophone by Kelly Jefferson, himself one of this year’s Juno nominees for Contemporary Jazz Album of the year. Barlow took a bow on the stroke of 10pm with her foursome of side musicians, then returned with only bassist Ross MacIntyre and guitarist Reg Schwager for a two-song encore of a plaintive delivery of Buffy Sainte-Marie’s Until it’s time for me to go and O Pato – a song about a duck! There is certainly no dearth in female jazz singers and while Emilie-Claire Barlow is hardly a jazz innovator, she sets herself apart from the crowd with legitimate ‘street-cred’ and an ability to relate to every kind of audience with a personable style of delivery.